This site is a description and chronology of the Amateur Radio Station owned by Matt Strelow. Sunday EU run '02 CQ-WW Phone contest. F-R: K6AW, HC1OT, K1DG, and N6HB. The station is designed for competition in the multi-operator multi-transmitter category of high-frequency DX contests, and makes no compromises for other categories or types of contests. Few will want to duplicate a station like this  there are less than ten such stations in the United States  but we hope that the people involved and the lessons learned are interesting to many. The KC1XX contest station has evolved over a number of years. 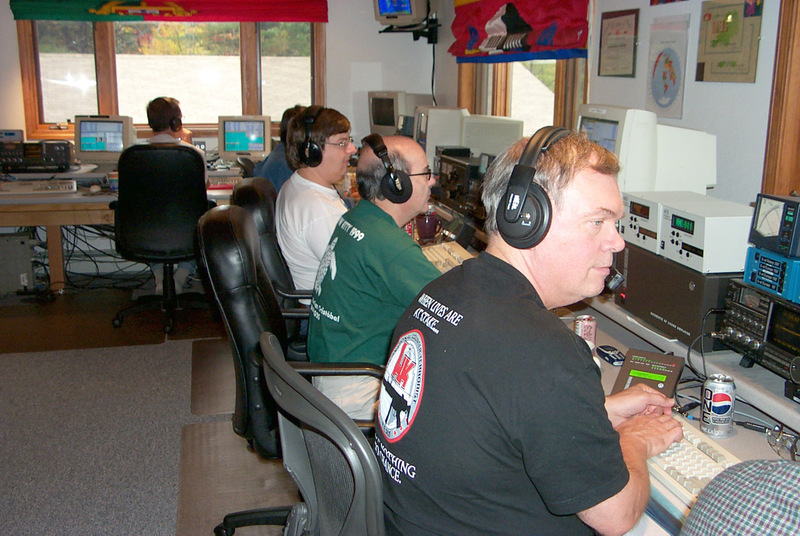 We started serious contesting in the Multi/Single category at the old QTH in Tewksbury, Massachusetts. That was back in 1993. We won M/S both modes that year, and again in 1994. The move to the current Mason, New Hampshire location occurred in July of 1995. In addition to the normal events that surround any household move, work was immediately begun on rebuilding the station. The first win from the NH QTH was CQ-WW SSB that same year...still M/S. At that time, we had a single 180' (55 meter) tower with 4/4/4/4 on 20M, 2 element shorty-40, and 5 elements on 10M. Additionally, there was a single 80M loop suspended from the top, and a 160M sloper at the 130' level. A 60' tower with a 4 element 15M yagi was installed the day before the test! Station operators then were: AD1C, KM3T, KC1F, AA1ND, K1EA, KA1XN and others. All of these people are still actively involved with the station (some with different calls now). The station and operator lineup were continually refined over the next several years, until there were no more "mountains" to climb. The KC1XX team ruled Multi/Single. The K3LR 40M OWA that replaced the shorty-40 certainly played a role (check here for a typical example of results achieved). After the 1997-1998 contest season, the decision was made to convert the station design into a no-compromise Multi/Multi (Multi-Unlimited). To accommodate this, a new radio room was constructed, and a loft for operator sleeping quarters was added to the house. The current station configuration consists of seven (7) discrete operating stations (one for each of the six HF Amateur bands, plus a spotting position). Visitors are welcome, but please contact Matt first to ensure an appropriate reception and to discuss transportation. Guest operators are also welcome. Smoking is not permitted in the house. Civilized behavior is required  you will be interacting with Matt�s family as well as the other operators. A good sense of humor is important, as is familiarity with the CT contest software. Again, please contact Matt first to arrange a spot on the roster of operators.